Theresa May should condemn Hungary's "reactionary" government, Labour has said, following the refusal of Tory MEPs to back a censure motion. Shadow Cabinet Office minister Jon Trickett urged the PM to speak out against Viktor Orban's administration. Two thirds of the European Parliament backed action against Hungary's government, which is accused of attacks on minorities and the rule of law. Environment Secretary Michael Gove said the MEPs were not endorsi ng Mr Orban. But on the BBC's Andrew Marr Show, he refused to condemn the right wing prime minister directly, saying a "long-standing principle of a number of MEPs from different countries" was not to interfere in the "internal democracy" of other states. Mr Orban presents himself as the defender of Hungary and Europe against Muslim migrants. Criticised for his authoritarian style, he has told Hungarian TV: "We will never allow Hungary to become a target country for immigrants." What sanctions can the EU impose on Hungary? Mr Trickett said it was "shocking" that Conservatives had whipped their 19 MEPs to vote against the motion to censure Hungary, with only one defying the order. He said the environment secretary had declined the opportunity to distance himself from Mr Orban's "authoritarian and anti-democratic practices", adding: "Theresa May should do w hat Gove failed to do and condemn the Hungarian government." Viktor Orban was re-elected earlier this year after campaigning on an anti-immigration platform, with his Fidesz party winning two thirds of parliamentary seats. It introduced a law which made it a criminal offence for lawyers and activists to help asylum seekers, under the banner of "facilitating illegal immigration". But there have also been reports of pressure being put on the courts and the elect oral system and widespread corruption. The European Parliament has voted to pursue unprecedented disciplinary action against Hungary over alleged breaches of the EU's core values, which it denies. The ultimate sanction, the suspension of Hungary's voting rights, is not being proposed. But the EU Council - the heads of government of the member states - will now begin a process which could lead to potential recommendations being made against Hungary. After Wednesday's vote, the Board of Deputies of British Jews said it was disappointed Conservative MEPs had voted in "defence" of Hungary, while the Muslim Council of Britain questioned whether the Tories were seeking backing for its position on Brexit in return. Shadow chancellor John McDonnell was among the Labour MPs to criticise the vote at the time, urging Theresa May to "call out" her MEPs. Conservati ve peer Lord Finklestein described it as "a really distressing thing to happen and shameful". However, the Tory MEPs had stressed their vote should not be seen as a backing of Mr Orban. 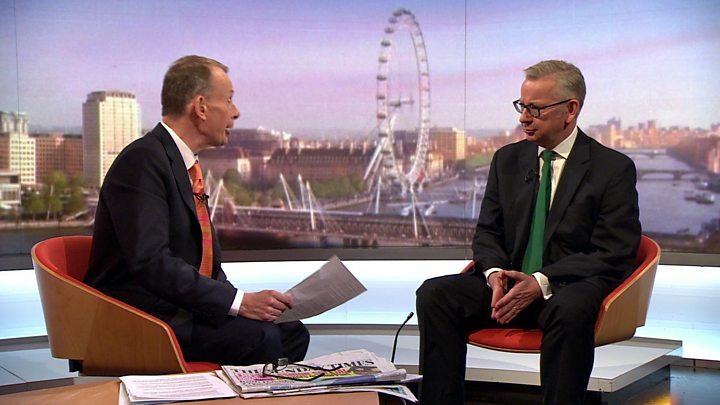 Mr Gove told Andrew Marr: "It is not for me to rank a league table of EU leaders. "It's a long-standing principle of a number of MEPs from different countries and from different parties not to believe that the European Parliament should interfere in or censure the internal democracy of a particular country." Challenged to directly condemn Mr Orban, he said: "You or I might have particular views about other countries but the European Parliament and those within it - British MEPs and others - believe that's the wrong way of expressing criticism." "I don't believe that individual criticisms of the kind you are understandably attempting me to make necessarily help us in ensuring we get both solidarity on the issues that count and the best deal for Britain as we leave the European Union."